Follow God’s example, as dearly loved children & walk in the way of love, just as Christ loved us & gave Himself up for us as a fragrant offering & sacrifice to God,~Ephesians 5:1-2. If I could speak all the languages of earth and of angels, but didn’t love others, I would only be a noisy gong or a clanging cymbal. If I had the gift of prophecy, and if I understood all of God’s secret plans and possessed all knowledge, and if I had such faith that I could move mountains, but didn’t love others, I would be nothing. If I gave everything I have to the poor and even sacrificed my body, I could boast about it; but if I didn’t love others, I would have gained nothing,~1 Corinthians 13:1-3. Our lives will be measured by how we love. It’s not something that’s preached in many pulpits anymore, yet Jesus taught on it all the time. He taught we are to love God with all of our heart, soul, and mind and love our neighbor as we love ourselves. He stated if we love God, we would obey Him. He also stated there would be many when they see Him face to face who will say, “Look at all the good things I did in Your name. He will reply-I was hungry and you did not feed me, naked and you did not clothe me, in prison and you did not visit me…whatever you did to the least of these, you’ve done to Me. Depart from Me, I never knew You-(Matthew 25:31-46, Matthew 7: 21-26).” These weren’t people who lived believing they’d miss heaven. They lived forsaking the greatest commandment; love. They lived not applying the Gospel to their lives. God cares how we treat Him and others. It’s all through the Bible. Humans often equate love with warm fuzzy feelings or being able to have their way. Neither is biblical love. God corrects, rebukes, and provides consequences and boundaries for us so we can learn. He does not treat us poorly; He leads us to paths of righteousness so we are not destroyed by sin. No matter how we view it; sin destroys it’s host. As a loving parent, He can’t stand by and watch us kill ourselves. Though if we are super rebellious, He will give us over to our sin (Romans 1:28). If we wait to feel love, we will only love a select few. God didn’t tell us to only love the happy, shiny, nice people. I wish that were true, but it’s not. He said love everyone! He gave His Spirit so we had 24/7 built in love. If I only loved when I felt love, gosh, that’d be 10-20 percent of the time and only a few people in my life. I’m not primarily a feeler; I’m a thinker. My brain dominates my heart. I’m learning to allow the Holy Spirit to direct my brain. God didn’t tell us to give everyone full access to our lives or to be close friends with everyone. Trust me, you will be destroyed if you give everyone the same access to you. Be friendly, compassionate, a servant to all. Even Jesus only had a few disciples He pulled closest to Him. His love was the same, the level of intimacy was not. I’ve upset many people in my life by ending relationships that causes chaos, drama, trauma, or simply weren’t helping me grow like Christ. 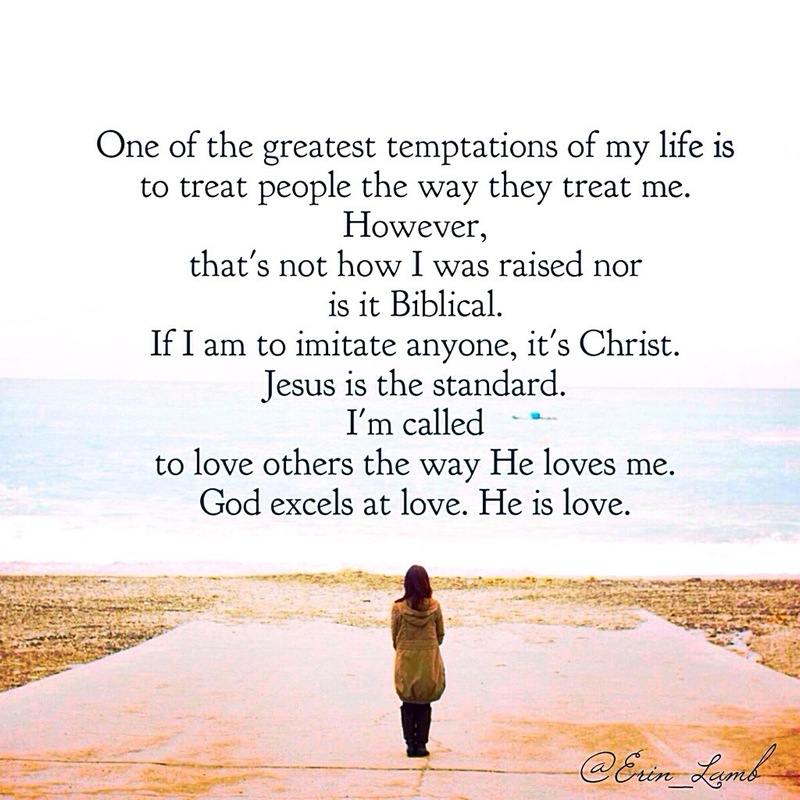 My goal isn’t to please people; it’s to be in God’s will. If it’s destroying your relationship with God, it’s abusive, there’s never peace, etc…ask God what type of relationship it should be. Married people have a greater responsibility. If it’s a random person you befriended, love them…but set boundaries. Even married people are called to point their spouse to Christ by setting boundaries, correcting, and rebuking. Jesus corrected, rebuked, and had boundaries with people. Pray for, bless, do good, yet don’t let people continually destroy what God is trying to build. Jesus is the standard. Even if the entire world stands against you; your role is to represent (Re-Present) Jesus. Love your enemies. Do good to those who hurt you. Bless those who curse you. It is the way of a disciple of Jesus. It’s not easy; it’s possible through Christ who gives you strength. We are not mini saviors. We are called to imitate Jesus by walking in love! We are called to be His ambassadors of love in the earth. The world will know we belong to God by our love. Be blessed today. You are loved with an everlasting love! The key to loving well is abiding in the One who is love (John 15:5). We love because He first loves us. 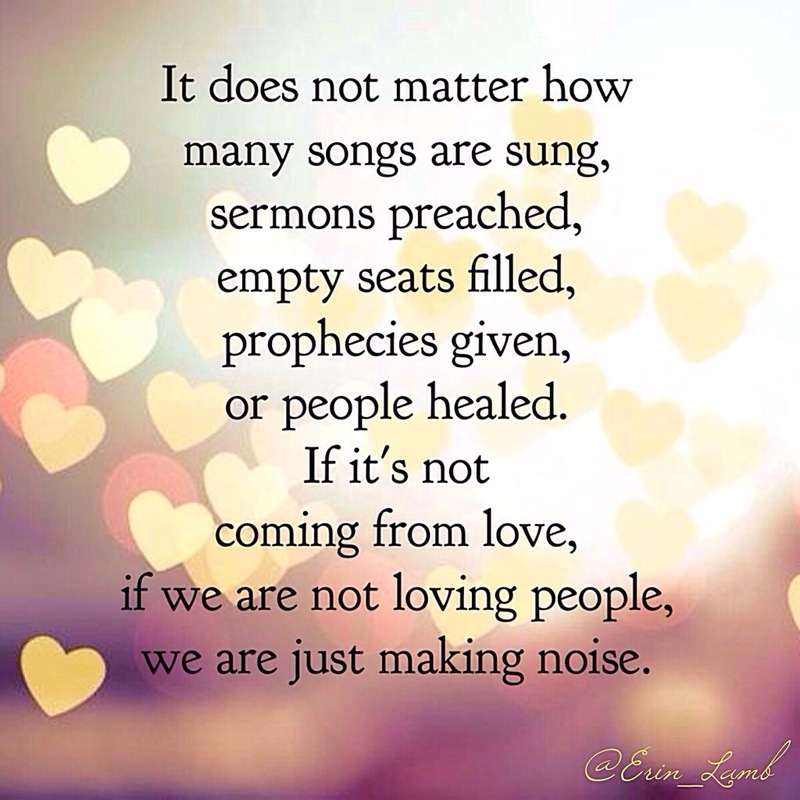 We recieve His love and let it pour out onto others.